While my primary fascination is with the temple architectures of India and SE Asia, Mayan civilization and its sophistication always intrigued me. This took me to the ruins of Chichen Itza and Tulum in Mexico in 2008 and Tikal and Flores Peten in Guatemala in 2015. Unfortunately, I had run out of time to see Miradar in Peten Department of Northern Guatemala on my trip to Tikal, which is believed to be many times larger than Tikal. Chichen Itza is a city state in Yucatan peninsula in Mexico which flourished from 800 CE to 1300 CE roughly. There are different architectural styles involved in the constructions – Puuc style in the early stage and Maya-Toltec style at a later stage being the significant ones. 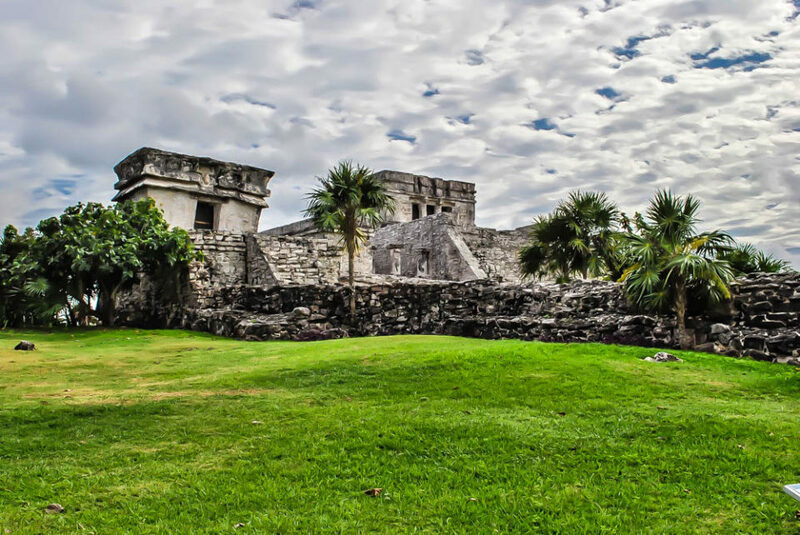 El Castillo or the Temple of Kukulkan, Caracol – a circular stellar observatory, Jaguar temple, Temple of warriors, Great Ball court, Group of thousand columns, Mercado are significant constructions which stand today and vouch to the sophistication of the Maya–Toltec style of architecture. Apart from that, sacred cenote or Cenote Sagrado, which is natural limestone sinkhole survives today. This sacred cenote is a pilgrimage center for the Mayans and human sacrifices were common during the drought season invoking the rain god. Tulum is a port city for Copa in Yucatan peninsula in Mexico. It was formerly known as Zama and stands on a bluff by the Caribbean sea. It perished few decades after Spanish has set foot in Yucatan peninsula due to the Old world diseases brought by Spanish. 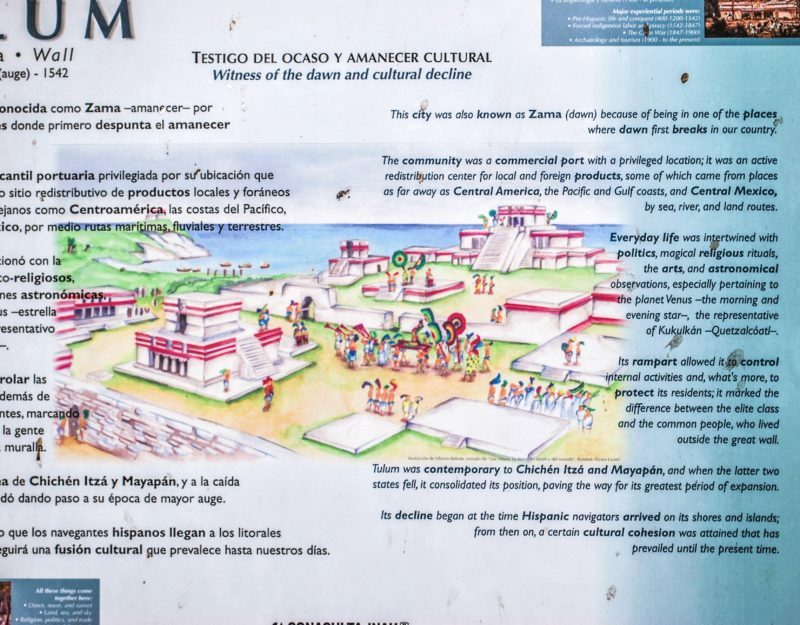 Mayans had no resistance to these old world diseases such as smallpox and this caused a collapse of the society in Tulum forcing the Mayans to abandon the city. 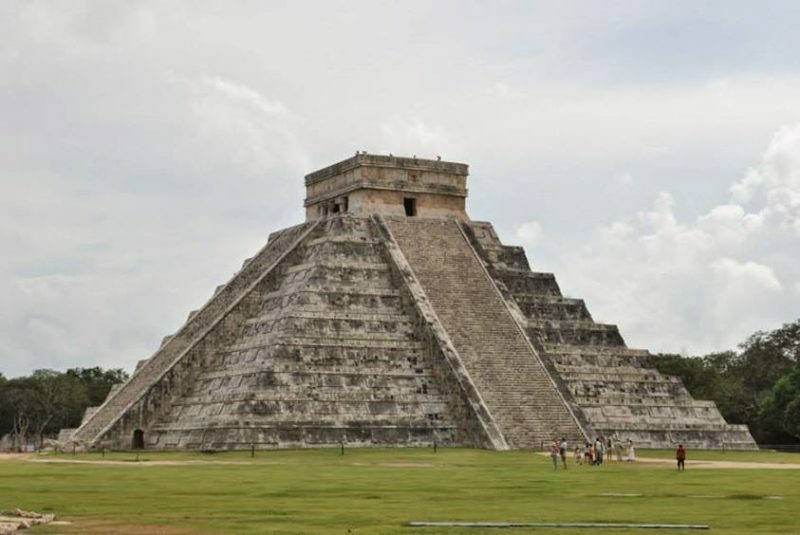 Famous constructions which survive today are El Castillo, Temple of Frescoes and Temple of descending Gods. Tulum or Zama was a seaport on the Caribbean sea in Yucatan Peninsula in Modern day Mexico during Mayan times. Tikal, formerly called as Yax Mutal is a Mayan ruin near the border of Guatemala/Belize in the Peten department of Guatemala. It is a UNESCO site today. It is the best understood city state today due to the many Stelae containing hieroglyphic texts which provides details about Tikal . There are pyramids, plazas and numerous stelae which has been excavated though 1000 more structures are yet to be excavated. Noteworthy structures are the Grand Plaza, North, Central, South Acropolises and temple pyramids I-VI. The North Acropolis served as the Necropolis for the Royals. Each of these Acropolises has altars and stelae with hieroglyphic texts providing details of the civilization. Flores Peten in the Peten department of Guatemala, previously called as Nojpeten or Tayasal was the capital of the Itza Maya Kingdon. It is an island surrounded by Peten Itza lake. Flores Peten is where the Itza Mayans made their last stand against the marauding Spanish in 1697. Today it is a backpackers’ paradise with budget to high-end hotels and restaurants. The archaeological site is north of the modern city of Flores Peten. 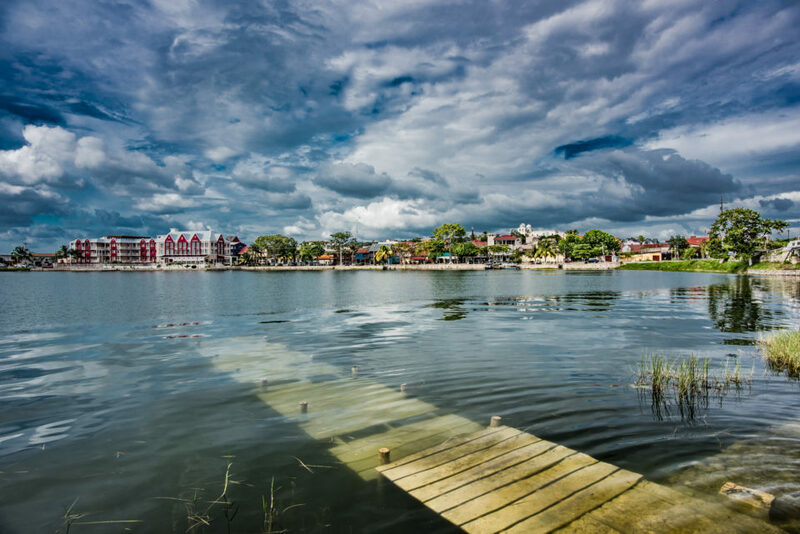 Modern day Flores Peten called as Nojpeten or Tayasal surrounded by Lake Peten Itza – capital of the Mayan Itza Kingdom. Mayans were an advanced society with a flourishing MesoAmerican culture/architecture until destroyed by the invading Spaniards around 16th/17th century. Mesoamerica was a Pre-Spanish cultural region encompassing the roughly today’s southern Mexico and most of Central America except Panama. The period spread from 7000 BCE to 16th/17th centuries. 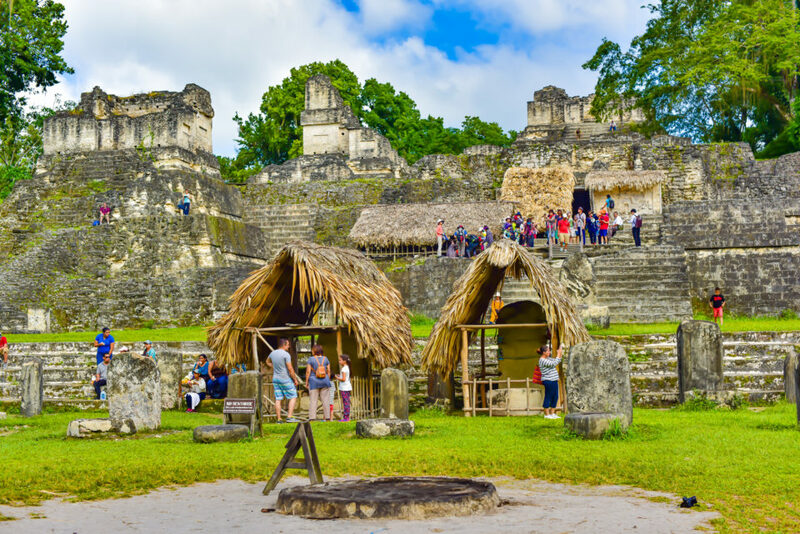 Mayan societies flourished as city states in places like Copan in Honduras, Tikal in Guatemala, Caracol in Belize, Chichen Itza in Mexico and Peten Itza in Guatemala. Mayan civilization flourished from roughly 1800 BCE to 1697 and can be roughly broken down into pre-classic(1800 BCE – 200 CE), classic(200 CE – 900 CE) and post classic era(900 CE – 1697). 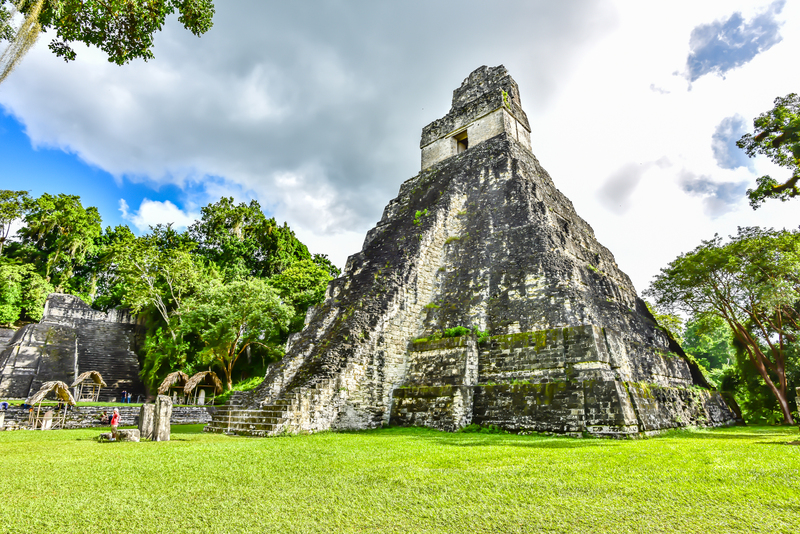 The rise and fall of Tikal coincides with the classic era while Chichen Itza flourished from around 800 CE till about 1300 CE. Tulum, a port city in Yucatan Peninsula, flourished between 1200 CE – 1400 CE. Mayan architecture had a relationship between cosmology, religion and geography. For example, Tikal pyramid temples, Guatemala were built to align as per sunrise during solstices/equinoxes. Mayans did not have sophisticated tools which was available in the old world at that time. So their constructions involved labor intensive process. Either people carried the construction materials on their backs or rolled them over using logs. For building materials, they used stones found near the site of the construction, commonly limestones. They would use mortars or plasters as binding materials, which were made using limestones and freshwater and burnt using fire. Evidence were found on the use of Pozzolanas in the lime making technique. Great ball courts, where some very bloody ball games were played and also used for rituals as well is found in different Mayan sites. It has some amazing acoustics, till date people have not been able to decipher the magic behind this kind of acoustics. While the one in Chichen Itza was huge with size of 96 meters in length and about 30 meters in breadth, the one in Tikal is times smaller. Mayans who were cultivating crops setup the farms near the cities. The choice of farming is the Milpa. Alternate name for Milpa is slash and burn. The technique is simple in that they burn the forests and leave the ashes for the soil to absorb and get enriched and they farm till the soil loses its nutrients. Then they allow the farm to be consumed by the forest. Other methods they used were the terrace farming method. Mayans used mostly stones and wood for their weapons for war and farms. Flint and obsidian were used as arrowheads. 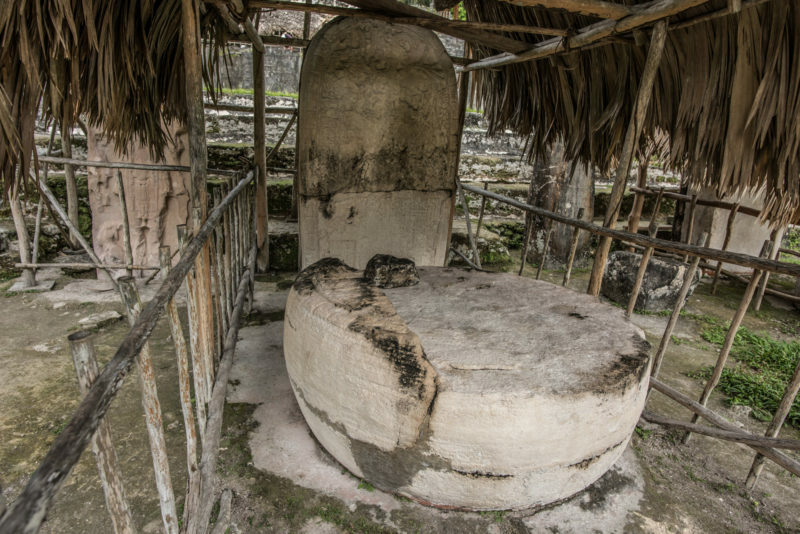 Stelae, found in different Mayan ruins, are stone shafts dedicated to different kings & containing figures of Kings & hieroglyphic text(Mayan script) with sacrificial stone altars provide fascinating insight into the Mayan culture and history. There are more than 800 hieroglyphs representing one syllable each. Mayanists were able to decode Mayan hieroglyphic only in the last century. Notable one is Tatiana Proskouriakoff, an accidental Mayanist whose work helped decode important hieroglyphic texts. Mayan books were written using these hieroglyphic text on strips of bark of fig trees. Many of these books were destroyed by the invading Spanish on the pretext it was the work of the devil. Thus the cultural terrorism inflicted has denied the modern world more indepth peek into the Mayan civilization. Stelae with the Hieroglyphic text providing details of Tikal history with the stone altar, probably used for sacrifices including human. How to get to Chichen Itza or Tulum? The nearest international airport is Cancun which has direct flights from major cities in USA and is 4 hours away. I rented a car from Avis in the Cancun Hotel Zone and visited Chichen Itza and Tulum on 2 separate days. Cancun to Tulum is about 2 hours while Cancun to Chichen Itza is about 2 hours and 15 minutes. There are tour buses available too from Cancun Hotel Zone. There is a toll road which rival the Interstate highways of USA from Cancun to Chichen Itza. There is also local road which is free unlike the toll road and you get to see the Yucatan country side. Cancun Hotel zone has large beach front resorts which are mostly All-Inclusive ones. Flores local airport is the nearest airport to Tikal. One can fly to Guatemala city and take a local flight to Flores. I took a water taxi from San Pedro, Belize to Belize city. From the same terminal of water taxi in Belize city, I took Fuente del Norte bus to Flores. The bus stops at Santa Elena near Flores. And the bus folks will provide you the local transportation from Santa Elena to the island of Flores which is surrounded by the Lake Peten Itza. Fuente del Norte folks provide English and Spanish guidance regarding the immigration clearance on the Belize/Guatemala border. I stayed in the island of Flores and booked a local trip to Tikal for next day from the same folks who provided the local transportation from Santa Elena to Flores. There are high-end hotels like Ramada in the island of Flores. I stayed at Hotel Sabana, a budget hotel and was convenient for me to walk around. There are lots of restaurants providing free wifi in the island.